Whether via ferrata or pedestrian zone, whilst mountaineering or on the ski slope - for the whims of Mother Nature, man is well prepared with functional and suitable outdoor clothing! The range of functional textiles is huge and covers a very big amount of terms such as "hardshell" or "softshell", which can lead to confusion. Since that should not be the case, and functional jackets and trousers for all purposes, whether for sport or everyday use, can very well be chosen through an individuals needs, the following details will provide assistance in choosing the right outdoor clothing for men. "Form follows function." This mnemonic, which a design puts first as its functionality, is a good first point of reference for the selection of the appropriate outdoor clothing for men. Firstly, you should think about the purposes of your functionwear. The temperatures and seasons as well as the intensity of the activity will play the most important role. Someone that is looking for a lightweight summer jacket for cycling, has different priorities to someone who wants the perfect winter jacket for the city. Even the weather protection plays an important role. 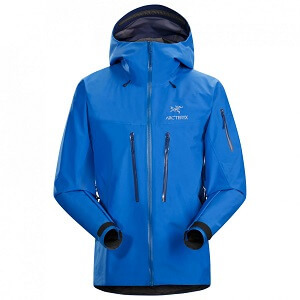 There is outdoor clothing for men made from extremely robust, storm-resistant materials for alpine climbing and on the other hand comfortably lightweight, air-permeable materials which ensure the best comfort. Moreover one can in principle distinguish between insulating clothing and weather protection clothing. Fleece, synthetic fibers and down always have warming properties, whilst soft shells, hard shells (rainwear) or wind jackets are reliable protection against the elements. Once the appropriate material for your needs have been found, the next step is looking at the needed equipment and design of clothing for men. Usefully attached and sufficient pockets, a hood or additional ventilation play just as important role as the right fit. The latter is worth considering, depending on if you want to wear the outdoor clothing for men as a first, second or third layer: Underwear fits snug to the body, whilst a raincoat can be wider. In general, outdoor clothing for men made in America, Britain and Scandinavia tend to be large, whilst German or Swiss manufacturers usually cut slim fits. Especially in sporting activities, the wearing of several (thin) layers has been proven ideal. As such one can, depending on the weather and heat sensitivity, simply take off or put on a layer. As a so-called first layer of men's clothing is thus a functional underwear (baselayer) made of polyester or virgin wool (not cotton! ), which efficiently transports sweat to the outside and feels pleasantly soft against the skin. The second or mid layer of outdoor clothing for men is usually made of fleece, synthetic fiber or down, sometimes even soft shell. The mid layer provides good insulation in colder weather or creates a good weather protection in mild conditions, whilst at the same time often thus forming the third layer. The outer or third layer of outdoor clothing for men always has weather protection characteristics and is usually softshell, hardshell or wind-resistant fleece. To cover as many weather conditions and activities as possible, it is useful to have some basic textiles in the closet and to then combine them depending on the weather and use of the day. A waterproof jacket should never be missing in a outdoor clothing gear for men. It is breathable and creates a solid, reliable weather protection during continuous rain or changeable weather. Depending on ambitions, one can find lightweight, compact and very robust, rucksack-compatible models. On top of that a warming layer to be able to go out in cold weather. Fleece is soft, light and highly breathable. It is suitable for men's clothing particularly as a second layer and on sports tours. Synthetic fiber is even lighter and warmer, but less vapor permeable. If you however go out in freezing weather and demand a lightweight material, then down is the answer. So-called 3-in-1 jackets combine the advantages of weather protection and insulation! Functional underwear forms the basis of every outdoor wardrobe and has at least as much an important role as reliable weather protection. Cotton soaks up sweat, dries slowly and is not recommended for sporting activities. As such, it is better to choose polyester or virgin wool (Merino). Synthetic fiber dries fast and is ideal for intensive tours. Virgin wool is easy to maintain and odorless. It can thus be ideally used for multi-day tours and for extensive use. 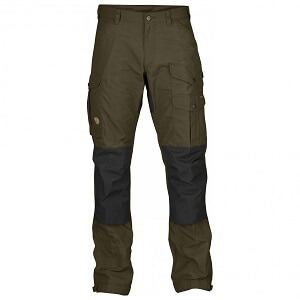 Last but not least outdoor clothing for men made of softshell: These trousers and jackets make the compromise of warming fleece and weatherproof hardshell. They are suitable for most weather conditions, are slightly warming and highly wind and water resistant. Thus in daily life and on tour, they cover anything from the right warmth to being totally waterproof!